Are you interested in getting more information or a quote for the Liberty? Please fill out the form below and one of our Territory Managers will be in touch shortly. Liberty is our heritage line of mechanical, ground-wheel-drive spreaders. 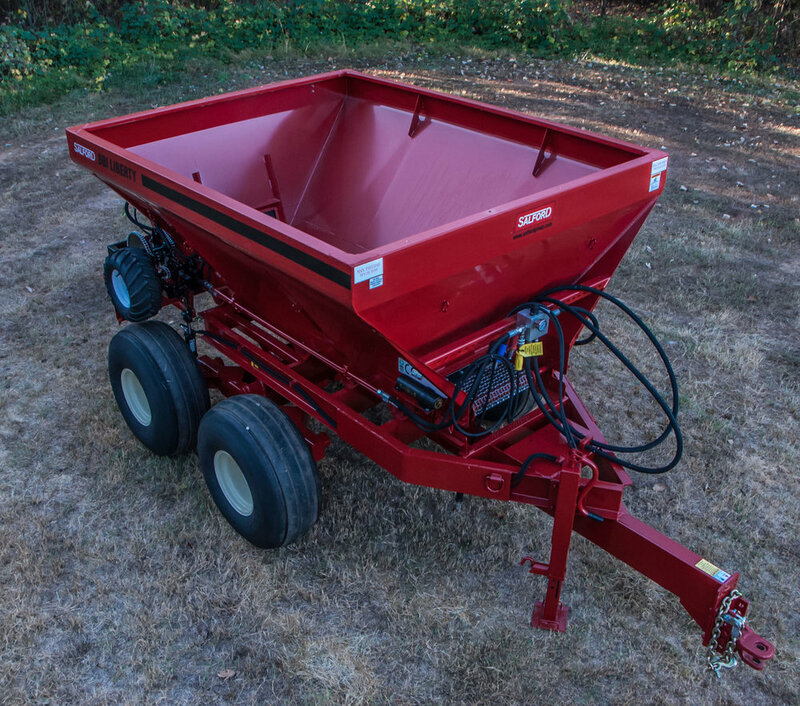 Medium capacity for a variety of farming applications, built with the original precision Salford spreader system for targeted distribution of fertilizer and lime. 10 feet long, tandem-axle frame, built tough for rugged terrain. They called it Liberty, and it did its name justice, setting the precision nutrient applicator sector free of its previous limitations. 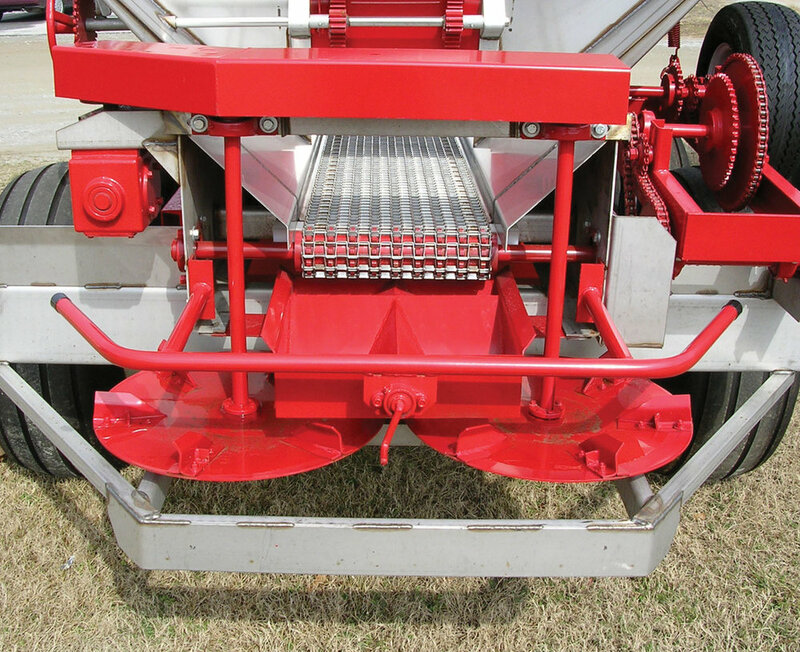 Gone were the days of just “lettin’ it fly.” With the advent of Liberty, you could really target your fertilizer and lime applications with unprecedented precision with the original Salford spreader system. Liberty is a mechanical field dynamo, featuring a ground-wheel-drive conveyor. 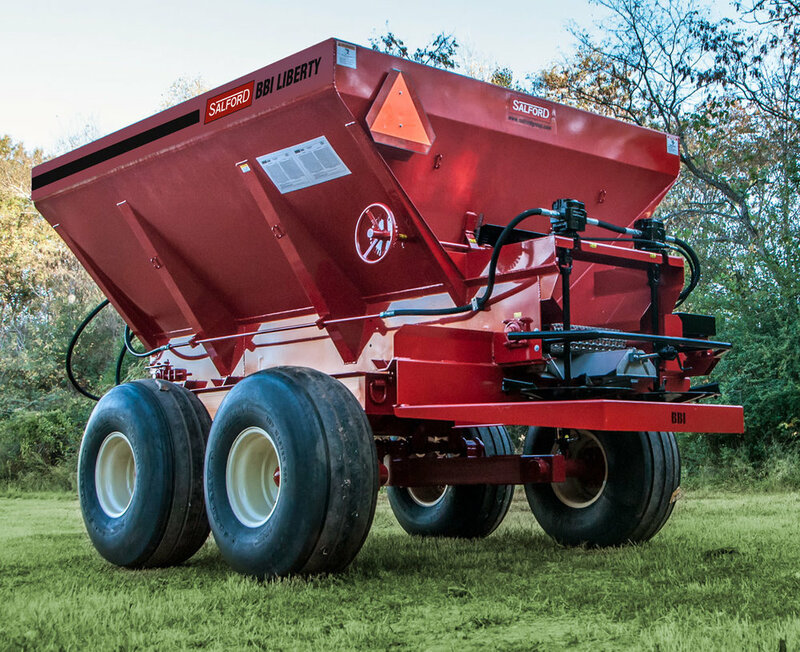 The Liberty fertilizer and lime spreader gets its ample power from PTO or hydraulic-driven spinners, getting the job done on small to mid-sized farms. Liberty pull-type spreaders are designed to be the toughest, most durable fertilizer and lime spreaders in the market. With BBI's rugged design and construction, you can more efficiently spread your fields, saving you time and money. At 10 feet, sitting on a tandem-axle frame, Liberty is ready for a variety of medium-capacity nutrient applications. Control your economic destiny and own your yield with Liberty, featuring the original Salford spreader system, now featured on the company’s wider range of hydraulic models. Our mission as a company is to improve the economics of our customers in the field, and we first articulated this philosophy in the design and manufacturing of Liberty, our heritage line of mechanical, ground-wheel drive spreaders for medium-capacity delivery of granular material. Liberty’s story details BBI’s commitment to continuous improvement, refining our design year after year. BBI Spreaders offers a warm welcome to one of our most recent additions to our family of dealers, Yost Farm Supply. Headquartered in St. Francis, Kansas, Yost Farm Supply serves a critical geographic area within America’s bread basket—northwest Kansas, southwest Nebraska, and northeast Colorado. The company features three locations—addition to the headquarters in St. Francis, Yost has dealerships in Goodland, KS and Imperial, KS.